I've previously blogged on the Weymouth and Panhandle A & B equations to predict the flow of natural gas through pipelines. 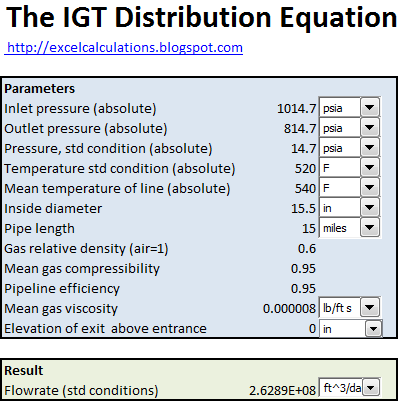 Today, I'll complete this series of posts by presenting an Excel spreadsheet that calculates the IGT Equation (also known as the IGT Distribution Equation) for the flow of natural gas. The equation is particularly suitable for high pressure, high flowrates through steel or plastic/polyethylene pipes. The spreadsheet allows you to choose between several units, and takes care of all unit conversions behind the scenes. It also enables you to model the effect of elevation changes on flowrates.